Last Saturday, September 17th a small group of people wore orange vests and intercepted cars entering Collins Bay Institution at the start of visiting hours for the day. 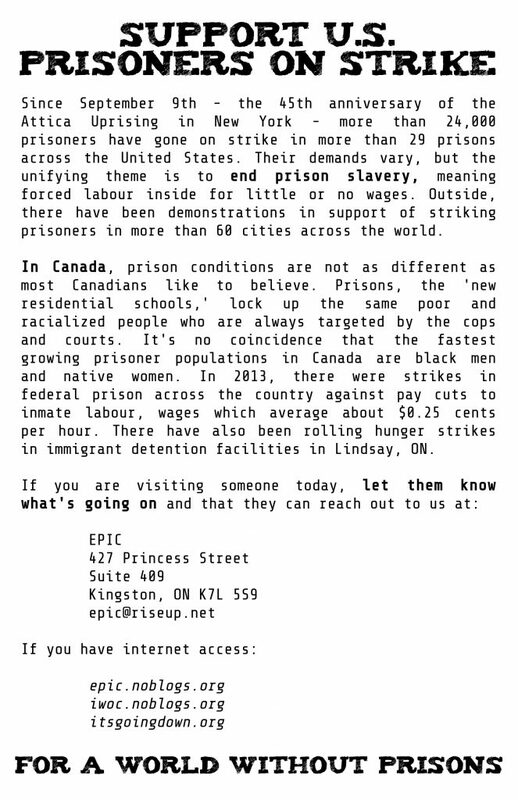 We were distributing flyers to visitors encouraging them to let their loved ones know about the U.S. prison strike and solidarity being organized in Canada, and to get in touch with us if they want to know more or otherwise correspond. We had many short, positive exchanges with visitors over the course of about an hour and a half. A copy of the flyer is pasted below. This entry was posted in Actions, Collins Bay, Strike, United States. Bookmark the permalink.